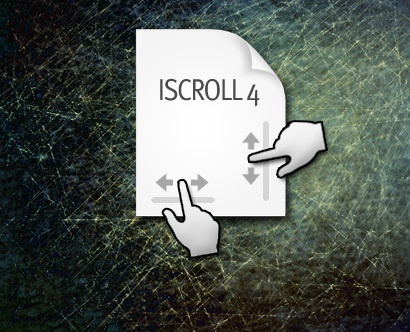 iScroll has features that make it useful beyond just scrolling – among many uses it can be used to create slide shows. I created one today at work and am sharing the entire process here. I already had certain parts of this done for other parts of my application so it took me about 10 minutes to get everything wired up. Since this example starts from ground zero it will take a little longer. Notice the UL width – since I’m essentially using it as the “wrapper” for the LI elements I need to set the width to equal the total width of all of the slides so that the list items can layout out in the desired manner. As mentioned I’ve set the width of the UL element so that its width equals the total width of all of the slides since it is the element that will be scrolled ***inside*** of the wrapping div. The wrapping div has an id of “slideshow” and is styled such that its “viewport” is the same dimensions as a single slide. Note also that it’s overflow is set to “hidden”. If the UL element didn’t have its width set the wrapping div would have forced each slide to stack which is not what we want – we want the slides to lay in a single row. Within the CSS note the position:relative lines on both the UL and the #slideshow – these are necessary so that iScroll can do the calculations needed to get everything to work. If you forget about this your iScroll wont work at all. Unlike prior versions iScroll 5 has its own website from which you can download the library at http://iscrolljs.com/. Below is an example of adding it to a page. Next we need to initialize the iScroll on our “slideshow” wrapper. We can do so once the page has been loaded like so (jQuery users can substitute jQuery’s document.ready instead). More information on initializing iScroll can be found here. Of note here is the iScroll configuration object found on line 7. The scrollX property’s “true” value tells iScroll to scroll horizontally. Swipe with your finger or your mouse to see the iScroll work. Ok, now we start getting into the things that will make our slideshow really work. First, lets make iScroll behave a little differently, lets make it snap to each slide instead of scrolling past slides when you swipe. iScroll has 2 properties that we can pass via a configuration object that will tell it to a) snap to an element and b) not overscroll past the element. They are snap and momentum where the former’s value will be set to li since we are snapping to those elements and for the later we’ll use a value of false as we want to disable overswiping. Slideshows typically have back and next buttons. Lets add them to our slideshow – we’ll start with some basic layout, we’ll have a left and right button on top of the slide show. Each button is a div and will be positioned over the slideshow on the left and right edges. You should have noticed by now that I’ve made no mention of jQuery thus far and in fact avoided it for the onload event that inits our iScroll. I didn’t want to use jQuery since it would mean using a big fat library to do trivial things. I know everyone likes jQuery so I’ll make a jQuery version that you can download at the end of this article. In the meantime your take-aways should be how to use iScroll not necessarily how to use jQuery for event delegation or whatever. That said, there are more iSrcoll things to learn which we will get to in a moment. Back on topic, we need to wire up the “back” and “next” buttons. I’ll first wrap everything in a div and then apply the listeners to that wrapping element. The following code does this for us, click the example that follows the code sample to see it work. What I’ve done is set things to capture the click events as they bubble up the DOM to the event listeners (a technique referred to as event delegation). The next thing we need is a way of advancing the slideshow in one direction or another. iScroll provides a method for this purpose called next() to advance the slideshow forward and prev() to advance the slideshow to a previous slide. There is also goToPage() but I’ll stick with the previous two methods – you can of course opt to use the later method to take advantage of the easing property that it exposes. This is all we need to get the navigation buttons working. See the code below followed by the working example. One thing that you might think is missing is disabling the buttons in some way to reflect that you are either at the beginning or end of the slideshow. By digging into the iScroll object we can find some properties that will make it easy for us to do this. _iscroll.on('scrollEnd',_hideShowNavButtons); // NEW LINE!! dim or show the buttons on "scrollEnd"
We’re done! You could of course add a lot more features such as notes or slide numbering, etc. Right-click and inspect the iFrame holding the final example above or see the complete source printed out below. Here are some hacks that I’ve discovered to get the most out of iScroll. The basic customization parameters are documented at www.cubiq.org’s website but you have to look at the cleanly laid out source to find the gems. But to get even better “lockDirection performance” try the following hacks. Locate lines 470 and 473 within iscroll.js. We’ll want to change a number from 5 to 0. Do the same with line 473. You should now notice that lockDirection with overlapping iScrolls works better than before. Done, your snapping should be much “snappier”. Note the “momentum:false” in the above configuration object. Momentum will be turned off. Ok, so this next way of doing it is a **complete** hack and is really only of geeky interest – but if you look at the iScroll source you will see that there is some old code present that is very similar to the code that precedes it. The new and old “duplicate” blocks are at lines 589 (new, momentum) and 608 (old, no momentum). Each block of code is surrounded by “if” statements that contain the exact same conditional. The “return” statement at the end of the first “if” block prevents the second “if” from running. It is necessary to comment the entire “if” block that starts at line 590 all the way to and including the return statement at line 605. Be aware that if you do this you are in effect creating a “global” change that will impact all iScrolls that you may employ. As a result, its best to stick with the perfectly functional momentum:false flag. // Do we need to snap? Done.... when swiping you will no longer swipe past the the adjacent snap-to element. As mentioned, this is done easier by adding the momentum attribute to the iScroll configuration object. Enabling scrollbars in iScroll is easy - making sure they are positioned where you want - easy as well as long as you position your div's appropriately. Even if you run into problems, you can hack the scroll bar into position. Once the above is done then iScroll will properly place the scrollbar along side your content. What if you can't change your css or don't want to? Then you can attack it with a little jQuery. So that you **always** get the last child as who knows how you're structuring your content. iScroll will disable the ability to give focus to certain form elements preferring instead to treat all interactions with the screen as something that must go through iScroll itself. You can get around this by adding the following function to the onBeforeScrollStart event - shown here as a configuration object while instantiating iScroll. You could also just add it to the iScroll source - view source, scroll down until you see the onBeforeStartEvent and add the function there. This isn't a hack per se as iScroll has a method to deal with the issue. In cases where you instantiate an iscroll on a hidden wrapper div and then reveal the wrapper by changing its display style to something other than "none" you will find that the iScroll-ed div will just bounce in its wrapper, refusing to scroll. Sometimes your content will just bounce in its container and not scroll at all. There are a couple things that cause this - 1 of them is the section preceding this one, the other is likely to be a simple line of CSS. Make sure that the div that is wrapping your content has a css display value of "block". Sometimes you'll have an iScroll whose contents are updated according to whatever the user has selected. If you have a long list and quickly scroll through them - and then try to update the contents of the scroll wrapper while your list items are flying by you may find that the list may update with new content but not be visible. That is, if you inspect the DOM you plainly see that your elements are there correctly positioned but they do not display (observed in Android 4.1.2). (7/15/2016) I just had this particular issue that took me quite a while to figure out - I had inited an iScroll with content that appeared to function correctly, but no matter what buttons I clicked in my scrolled content the result was a) what I programmed the button to do, and b) the iScroll would scroll back to the top (interestingly the scroll bar would NOT scroll to the top). Turned out that I had instantiated the iScroll twice in quick succession on the same variable - maybe creating some sort of race condition? You would think that one would overwrite the other... but fixing the code so that I created an iScroll instance only once resolved the issue.